The Dungeon Delve book looks exactly like something I’d love to look through and borrow ideas from. I’ve added a copy to my amazon wishlist to remind myself to get it soon. It’s a pretty cool book! I definitely still get inspiration from my copy. That is a great idea, Greg!!! That’s a great idea. I love the dungeon turn! Yeah, tiny dungeons are the best – and often the most memorable parts of adventures/campaigns. Working different challenges into each of the rooms was great too, to force your players into using their different strengths or different ways of thinking to work their way to the next room. I still remember the 9-floor drow tower with ‘arcane teleporting elevator’ I made, that required a different key-stone be used to get to each floor, so floors were effectively locked from anyone with the stone. It meant they had to locate stones and could skip floors if they solved earlier floors in particular ways. It was like a bonus reward system built into the rooms. Damn Ix. I ALWAYS want to play in your games. They sound so amazing. LOL. Thanks James 🙂 I’m a big fan of your world too. You’ve done an amazing job on it. That is a huge compliment coming from you, sir. Oooh, great post! My group meets monthly and does two 5-6 hour sessions in one day to make up for it. I’ll have to keep an eye out for that book! My current precious resource is a 2nd edition “Toolkit” that has pretty much anything I would want in charts to create instantly. It doesn’t do dungeons well, and I have to edit any stats to be 3.5e, but hey, it’s a great springboard for NPC and city creations. I have followed your blog for some time and I just now noticed that your blog is the tome Show. Irony I have listened to the tome show for some time. Great blog. Thanks so much for the kind words and your support, eyes, and ears. Loved checking out your blog too! The best part about Tiny Dungeons is that you get the taste for your Dungeon Delves and you can be in and out in one session often. 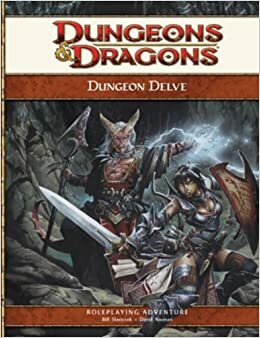 I also loved the Dungeon Delve book and it sill sits in a spot on my shelf as a go too idea book. Along with the great first ed Encounter cards. I had never liked with long Delves and that drew me as well to begin running Smaller Dungeons. The two biggest issues that I had with long delves feel to the time sink and the death of RP. Once a party dipped into the the first few rooms of a dungeon the games always would shift immediately from a free form fast paced game to a room by room slog. As well as because of this the first thing to fall by the wayside was inevitably the roleplay. I highly recommend for all GM’s to give the Tiny Dungeon theory a try. It will fast become thing of second nature once you embrace it. And you game the added bonus any Delve into a Large Dungeon becomes farm more epic in feel because your players are used to being in and out in a few hours of play.